For most fans of New Orleans piano, there are not nearly enough recordings of James Booker, considered by many to be the finest New Orleans piano man of them all. Though he appeared on many sessions with other musicians, including Aretha Franklin, Fats Domino, Earl King, The Coasters, Ray Charles, Lionel Hampton and Lloyd Price, he never really got the chance to stretch out on his own. The exceptions were a few singles here and there, including the minor instrumental hit, “Gonzo,” on Duke, and a few recordings late in his career, notably a magnificent live set and a well-received studio set with Rounder shortly before he died of an overdose in 1983. Booker’s frequent bouts with manic depression and drug abuse greatly hampered his career, as he was known to walk out in the middle of club appearances with no explanation, or frustrate producers by sitting and playing aimlessly at the piano for hours at a time during recording sessions. Despite his problems, when he set his mind to it, there was no one better at the piano, which made all the frustrations endured by various producers worthwhile in the long run. Classically trained, but also adept in blues and boogie, he would sometimes mix all these elements into the same song with exciting results. 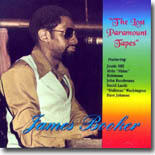 In 1973, Booker recorded a session at Paramount Studios in Hollywood with a cast of New Orleans musicians providing sympathetic backing. The master tapes of the session disappeared shortly afterward and were never found, but a tape of the mixes of the last night’s session resurfaced in the early '90s and was released in 1995 by DJM Records as The Lost Paramount Tapes. The results of this session are some of the loosest, funkiest New Orleans R&B that you will likely encounter. Booker, who at the time was on a methadone program to battle his heroin addiction, is at his very best (which is saying something), and it sounds like he’s using 20 fingers on the keys. Backing him are drummer John Boudreaux, percussionist “Didimus” Washington, guitarist Alvin “Shine” Robinson, Jessie “Mr. Ooh Poo Pa Do” Hill on tambourine and backing vocals, and David Johnson on bass. The song selection is a mix of covers (“Goodnight Irene,” an unbelievably funky “Feel So Bad,” “Tico Tico,” and an interesting “Stormy Monday/Hound Dog Medley”) and familiar songs in the Booker catalog (two versions of “Junco Partner” and a version of “So Swell When You’re Well,” where Booker’s piano had to have caught fire). Throughout the proceedings, Booker never lets up on the keys and the band never wavers, especially Boudreaux and Washington. If you’re a fan of James Booker and you don’t have this set, you should be halfway to the record store by now.